Yesterday, it was announced that Trump chose Jerry Falwell Jr. to lead a federal task force on higher education. Falwell is the son of The Reverend Jerry Falwell and he took over his father's role as president of Liberty University, an intellectual black hole that miseducates its students by teaching them that dinosaurs lived several thousand years ago. 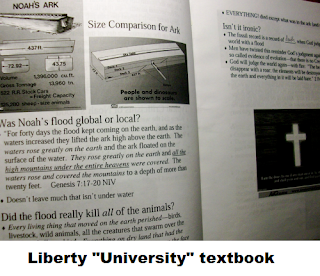 When noted scientist Richard Dawkins was asked about this, he said it was "an educational disgrace," Dawkins went on, "It is debauching the whole idea of a university and I would strongly encourage any members of Liberty University who may be here to leave and go to a proper university." One of Falwell's stated priorities is college accreditation; Falwell claims that the federal government is too strict on this matter. That is a relevant issue for fundamentalist diploma mill operators like Falwell. If a college is not accredited then it isn't eligible to disburse federal student financial aid. Liberty University, largely due to its huge online population, receives a whopping $800 million in federal aid! If academic crapholes like Liberty receive the proper scrutiny and they lose their accreditation, then the federal gravy train gets derailed. Not only is Falwell's appointment a huge conflict of interest, but an ignoramus like Falwell is manifestly unfit to lead a federal task force on education. Serious academicians consider Liberty University to be a pathetic joke. It's an insult to the institution of education to have an assclown like Falwell to have any say in education policy (ditto for his fellow dominionist Betsey DeVos). It wasn't always like this. Just a few years ago, the Obama administration convened an interagency task force that addressed abusive practices by for-profit colleges. It was led by then-Under Secretary of Education Ted Mitchell who credentials are a stark contrast to Falwell's. Mitchell received his doctorate from Stanford and he held important positions at UCLA, Dartmouth, and Occidental College where he served as president. He was also the president of the California State Board of Education. Under Obama, education task forces served the public interest and were led by competent professionals. Under Trump, they're led by mountebanks who will exploit their positions in order to continue to fleece their gullible students. We are living in a kakistocracy. UPDATE: Info on our forthcoming tract "Falwell in Hell."